What’s in a (Gluten Free) Brand? We all like to think we are far too clever to be influenced by marketing and branding, but organisations invest a substantial amount of time and effort into creating and protecting their identities; and as I’ve become more active in social media I’ve begun to notice my opinions of brands be influenced by the way they appear and interact online. I almost think of them as having personalities! So how do the gluten-free manufacturers hope that their brands mean to us and what different types of brands are there out there? I invited some of the stand-out gluten free manufacturers to talk to me about their brands. When scrummy start-up Perk!er launched, their branding was designed to “subvert” in a market where branding is traditionally “apologetic” or almost medicinal in nature. A great example of how the gluten-free market has moved in recent years from so many prescription rice cakes, to a gourmet or lifestyle market. Gluten free branding ranges from the very traditional to the fun and playful. 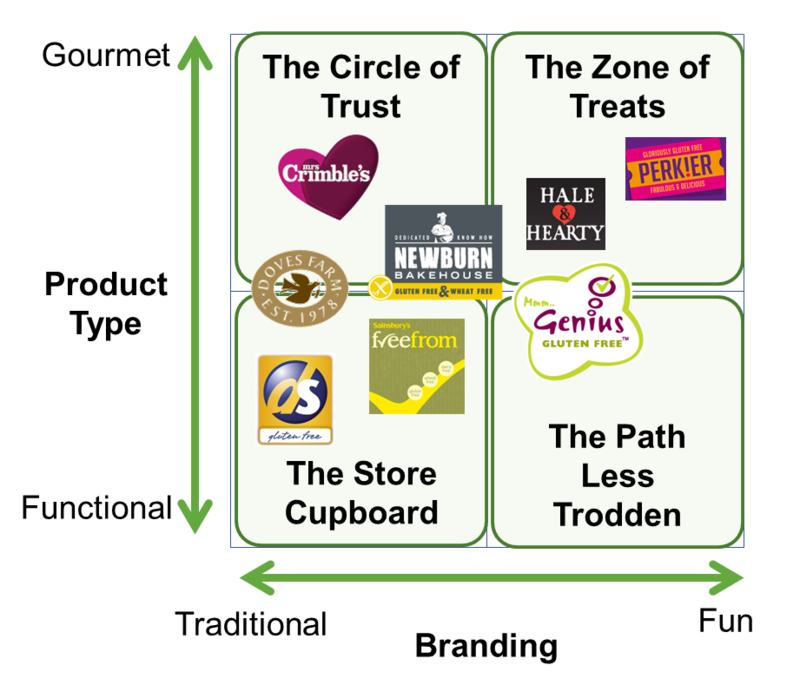 I plotted this on a little chart against the product type from ‘functional’ products to ‘gourmet’ products. I’ve added quadrants to show you how the branding makes me think about the product. The store cupboard – I keep this staple at the back of my cupboard for emergencies. The circle of trust – a little treat, often bought for me by a gluten eater because they know and trust the brand. The zone of treats – ooh look, how cool! I’m totally sharing these with my friends, but shouldn’t have too many. The path less-trodden – I noticed you around, I find you very attractive, is your product as good as I hope it is? If you have an indulgent product, you definitely get my permission to have fun with your brand, but there aren’t many people trying the path less-trodden – i.e. managing to create a ‘stand out’ or playful brand that is also relied upon as a staple. The obvious mainstream range playing with “stand-out” branding is Genius, which treads a fine line between fun and health-oriented. Their digital brand manager, Philli, told me that this was very intentional, especially as they pretty much invented the gluten free fresh bread market: “We wanted something which would appeal to potential customers and provide strong shelf stand out, which is why we opted for the bright colours and clearly defined logo shape. Creating an immediate warmth and personality was also essential”. Finding the balance between standing out and gaining trust from buyers is critical for a staple product in a health-concious market. Genius summed it up perfectly when I asked them to liken themselves to a car and they chose a mini: “Approachable, exciting, fun, stylish– always reliable”. A GF product, or a product that happens to be GF? 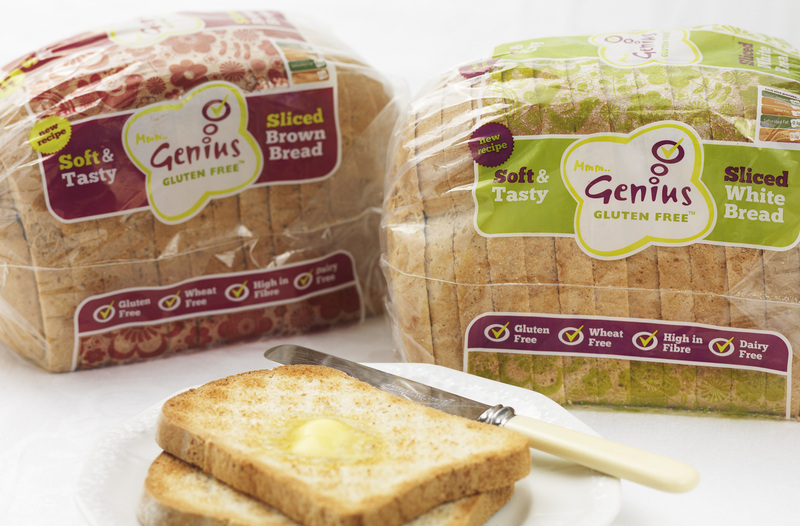 One of the biggest decisions a GF producer faces is whether to maximise their market by making the ‘gluten free’ a side note in the same way that Mrs. Crimbles do, or make sure their potential gluten free customers know your product is ok for them by making it a prominent part of the brand at risk of excluding the mass market. 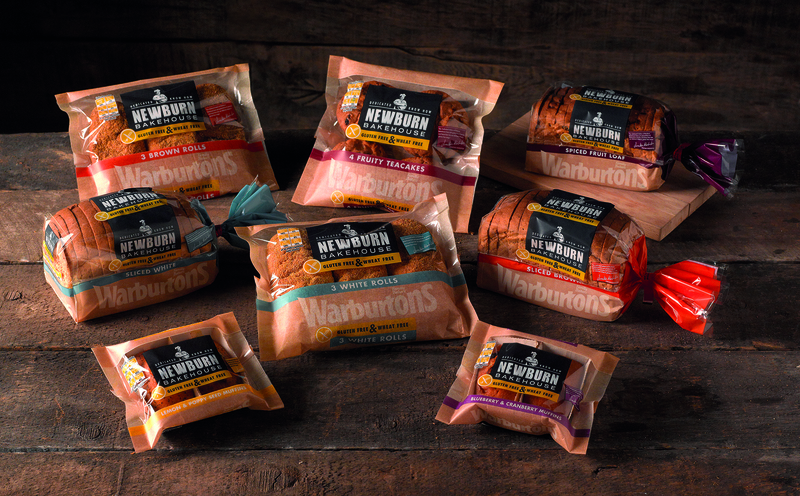 The Newburn Bakehouse relaunch is interesting in this context -they have taken a clear decision to make sure people can see the range is distinct from other Warburtons products whilst retaining a link through the traditional-style branding. Warburtons’ MD of Free From, Chris, told me that this “differentiation” would allow them to expand across new product areas whilst still providing the “reassurance” of the well-loved Warburtons brand. I wonder if this had resulted from any mis-stacking errors in supermarkets! The ‘gluten and wheat free’ subtext is prominent, but not the primary element of the branding which has a strong identity of it’s own. We’re being asked to think about that bakery and the heritage, not about being poorly coeliacs. The Newburn Bakehouse branding seems very well aligned to the product. Chris was talking about the product and bakery when he said “quality…strong provenance…stand-alone” but those words apply equally well to the new branding. To stock brands or own-brand? packaging designed to be “easily identifiable on shelf”. The litany of products that has recently been elbowing the eggs off the aisle in my local branch as Sainsbury’s seeks to become the top retailer for the gluten free market as part of their 20×20 sustainability plan. But why have they chosen a (somewhat controversial) own-branded product strategy over stocking consumer favourites like Dietary Specials? The dedicated free from team at Sainsbury’s told me that their strategy “is not just about breadth of range but also, and most importantly about providing great tasting products”. To that end they have launched new own-branded frozen options which have been tested against the leading brands with a panel of coeliacs. We can’t help but speculate that a freezer full of consistent gold and green packaging makes more of an impression about Sainsbury’s than stocking other brands might – the visual impact alone makes even a gluter notice that Sainsbury’s does free from – or as my colleague said “there’s definitely loads of it now, the aisle is like a mini supermarket all on its own”. The most interesting finding of my little investigation was how important trust was to all of the companies I contacted – and this isn’t so surprising in a market where you are helping people with health issues. We need to trust our food so much more than other consumers, not just to be tasty and fresh, but to be in good supply, easily identifiable and not to hurt us or make us ill. In that context the brand and visual identity a company builds is more important in the gluten free world than in many other places. The full questionnaires with the teams behind Newburn Bakehouse, Genius and Sainsbury’s give some very interesting insights into how they hope we see them, and also what we can expect to see in the coming year from the brands so I will publish those in full over the coming few weeks! *I’m a consultant, of course I made a 2×2!